For any gamer, whether casual or professional, good equipment is essential to ensuring a positive performance and is necessary in order to improve at gameplay. As skilled as you may be, a good worker still requires tools, so it is important to choose the best gaming keyboard that can help complement your abilities. The world of gaming keyboards can be complicated. There’s technical jargon to understand and countless features available, and with all the possibilities, it can be hard to narrow down your choices. Below we have listed the very best keyboards for gaming and reviewed each one so you can make an informed decision. 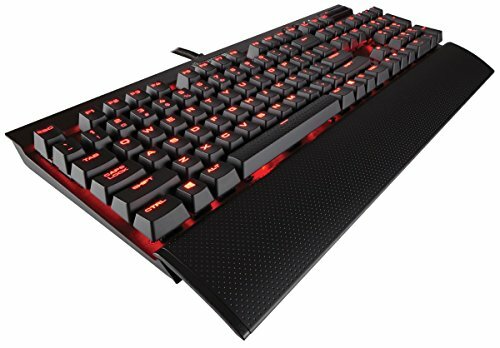 Conclusion: Which is the best keyboard for gaming? All gamers need to be able to press the keys they want and see feedback immediately in their game. As such, it is important that the keyboard you purchase is optimized for gaming and can help you perform outstandingly. Many keyboards have keys designed to respond quickly to even the slightest touch, allowing them to be extremely responsive and sensitive and not let a single one of your keypresses go to waste. This is also known as an anti-ghosting feature. The downside, of course, is that accidentally brushing a key may set it off, but anti-ghosting is mostly a favored quality of gaming keyboards. Rollover features are also great for speed and accuracy. A good gaming keyboard should also have keys that can record and perform complex macros with just the touch of your finger. Some may have as few as three, and others as many as 15, but the important part is that they are present. This can help you set off wicked combos during gameplay with just one key. In addition, gaming keyboards should allow you to have easy access to media controls, usually present as keys on the board itself, so that you can make adjustments without needing to pause a game. Some keyboards also offer the option for you to disable specific keys while playing so you avoid pressing them; the Windows key is one great example of a key that could do with disabling. The most important thing to make sure of is that the keys will last. Many companies have products out that have been tested to resist tens of millions of keystrokes without failing, and those may be the ones you want to go for! Keys should be durable so that they don’t just pop off, and if the keycaps do become faulty, they should be of an industry standard so that they are easy to replace. In order to game in any condition and under any lighting situation, it is often necessary that your keyboard has a good lighting system, where the keys are backlit. 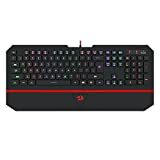 While many keyboards offer one color of backlighting, specialized gaming keyboards may offer an entire RGB spectrum so that you can customize your keyboard colors the way you like. The first question you should ask yourself is whether the keyboard you are eyeing has different lighting modes, and you should also consider your own personal lighting needs. A keyboard with three or more lighting modes can help if you are often in a variety of lighting situations. On the other hand, a simple non-adjustable backlit keyboard may be less expensive; just be aware that if there is no “off” setting for backlighting, it can be glaring or distracting in brighter lighting. Of course, next comes the issue of customization. It isn’t necessary to have a cool keyboard to be a gamer, but there is definitely no harm in trying for one. Some keyboards offer hundreds, thousands, or even millions of options for you to use when customizing your backlighting. You can choose between different colors, mix and match them, apply them in a gradient across the keyboard; it is all up to you. The more options you have, the cooler you might find your keyboard appearing – and also, the more expensive the keyboard gets. Some other cool illumination features you might be interested in is the ability to adjust the lighting of specific keys – like the arrow keys or WASD – separately from the rest of the keyboard. This is great for when you need something to stand out while playing, and it can help you focus better. You should also be aware of some common issues with illumination. It is not uncommon for some keyboards to end up being manufactured in such a way that some keys are brighter than others. Meanwhile, some simply don’t have the durability to withstand the test of time and will die out or bust sooner than you would like. So, make sure you are buying from a reputable company! A good gaming keyboard will offer more than just great keys and decent lighting. As most gaming keyboards are mechanical, some may have a stealth mode or may have been designed so as to make as little noise as possible. 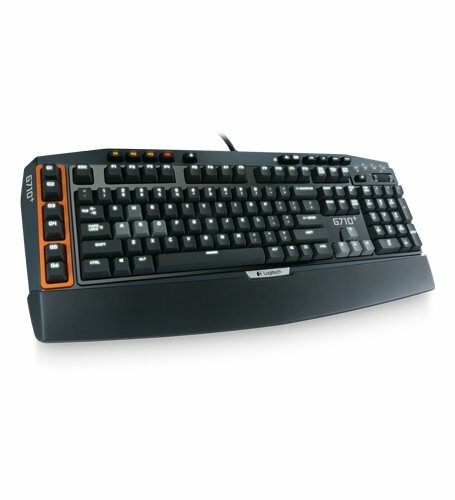 Not all gaming keyboards have this built in, so it is up to you if you want clicky keys or silent ones. Some keyboards also have USB pass-throughs so that you can plug in gaming accessories, like a mouse or a pair of headphones, easily into the keyboard without digging around the side of your monitor. Some are even carefully placed so that none of them will get in the way of your gameplay at all. There are even some keyboards that come with wrist rests that aim to remove fatigue, or at the very least, reduce it. This is especially important when you plan to game for extremely long periods of time. That comfort can help you play better and perform like a champion in comparison to someone whose hand is exhausted. In this section, we will cover five of the top keyboards you should consider for your gaming needs. The G710+ is one of Logitech’s premier gaming keyboards, not only of the enormous amount of programmable features but the tactile mechanical key switches that offer extreme durability. The overall design of the keyboard is standard ergonomically speaking, it looks like, well a keyboard with some orange shrouded gaming keys, but the ingenuity in the mechanics are where the G710+ honestly claims the fame. The external body is molded plastic, not brushed aluminum as are most keyboards in this class but even if you try and get the board to flex, it’s solid as oak. To illustrate this a little better, Logitech released a video of a G710+ stress test where they ran the keyboard over with a tank. Lone and behold, they keyboard still worked so that it can take even the angriest gamers abuse. Every single key on the board is backlit so that you can play in dark environments, the only issue with the backlight is the fact there’s limited control of the brightness settings. The board's macro keys are illuminated red and orange, and the rest of the keys light white. The keys themselves are excellent, they’re incredibly responsive but also light to the touch. The WASD and cursor keys are painted in a different color than the rest of the keys for a better hand, and eye coordination and the fully customizable orange G keys are designed to synchronize with whichever game you’re playing automatically. The problem with the board is the lack of a noise dampening micro rubber membrane so it’s a little louder than most keyboards, but Logitech’s designers added a rubber O ring beneath each of the keys to help reduce the noise. The Cosair K70 Rapidfire is quite possibly one of the most e-sport optimized gaming keyboards on the market today. The standard K70 and the K70 Rapidfire do share several features such as the external body design, subdued media keys, and proprietary volume controls. There are also several brightness settings keys as well as a button that enables game mode, which is a setting that disables all non-vital keys that would interfere with gameplay. There are also some differences between the K70 and the K70 Rapidfire as well. The big difference between the two is the introduction of slightly raised textured keys on the Rapidfire model that are pleasantly spaced apart when compared to other keyboards. Also, gamers can swap out all the keys at their convenience except the spacebar, but it’s also textured, so there’s plenty of friction for sweaty hands in heated matches. This keyboard is the first mainstream gaming keyboard to integrate Cherry MX speed keys. To put it lightly, they’re fantastic keys. They feature a much shorter actuation than standard keys, a difference of .8 mm, meaning they respond to an incredibly light touch, which is excellent for high-speed gaming but a little too imprecise for typing a document due to the lack of key resistance. The keyboard utilizes Corsair Utility Engine software, which allows for much greater customization of operating functions, but the software itself feels a little scattered and unnatural, but there have been several upgrades to the operating software. The amount of customization available to users of the CUE software is pretty in depth. Not only can you link the software to a majority of video game controls, but you can also utterly reprogram the keys, assign macro actions, create keyboard profiles, and a program to fully customize the illumination settings and lighting effects of the board itself. Now we have the Razer Black Widow Chorma keyboard. The Chroma is sleek, resilient and built strictly to be a gaming keyboard. Although it’s a mass-produced keyboard, it has a look and feels of a custom keyboard with the integration of Razer Greens which are marketed as Kailh switches, which are comparable to Cherry MX Blues regarding key low actuation points. You don’t have to beat your hands and wrists up anymore by button mashing and adding unnecessary harm to your body. Our next keyboard review covers a quality gaming keyboard for the budget-friendly readers out there who don’t want to or can’t shell out a small fortune for a good board. There are a vast number of budget-friendly keyboards, and the Redragon Karura K502 made the cut. Getting started, the K502 is a very stylish keyboard with quiet keys and an overall comfortable gaming experience. Overall, the keys themselves are designed to be low profile, which is fine, but maybe a bit of a change up if you're used to having high resting keys. In the overall experience with this keyboard, the low-profile key design works wonders in muffling the noise emitted from gameplay. It comes with the standard 104 keys with an additional 12 multimedia keys, which is an added benefit for the music and movie buffs out there. Regarding negative attributes, there are no additional keys added to the panel for gaming, so if that’s a selling point, you may have to opt for a more specialized gaming keyboard or learn the functions of this one. The only functional keys you can disable during operation is the Windows key. Which if you’re anything like me, accidentally hitting the Windows key while playing the Battle of Waterloo on Napoleon: Total War is not only aggravating but can be the difference between virtual life and death. The Karuras keyboard illumination indeed comes in handy if you’re playing in dark environments. The entire keyboard, as well as each key, is illuminated. you have the liberty of choosing from four separate brightness and contrast settings. You can choose from a diverse selection of color options such as green, blue, red, yellow, turquoise, purple, and white. The Redragon is compatible with a varied amount of PC operating systems such as Windows XP, Vista, 7, 8, 10 and Linux. So far, we’ve covered some excellent keyboards, but they all share one thing in common, they are large and designed for stationary gameplay. The size itself isn’t the only issue; mechanical keyboards are notoriously difficult to transport due to sturdy metal outer frames. The fifth and final keyboard on our review has an attribute that stands out among the other boards on our list. It’s designed to be compact; you can comfortably stow it in a backpack, ideal for tournament players and gamers who are concerned with mobility. 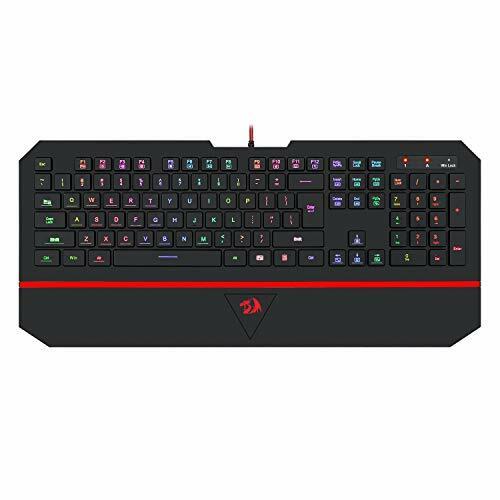 Mobility is good for competitive gaming and LAN parties with your friends, but the QuickFire TK may also be an ideal board for gamers who want a sturdy keyboard with top shelf mechanical switches but have limited desk space. You can choose between Cherry MX Blues, Browns and Red. The compactness of the keyboard doesn’t compromise the integrity of the keyboard. It’s solid plastic, just like the QuickFire Pro. The illumination LED’s correspond with the Cherry MX keys you choose, except for Cherry Browns, their LED’s are white. The F1-F4 keys make illumination adjustments. Since the keyboard is so compact, some of the keys control several functions, such as the incorporation of the arrow keys with the number pad keys, but it’s simple to change the functions, so it’s not as daunting as it seems. All the video and audio controls incorporate with F5 to F11, but I do have an opinion about the placement of the windows key next to the spacebar. Accidentally pressing the Windows key in the heat of the moment isn’t what I’d call a pleasant experience, but it is what it is. This keyboard comes in an array of color themes, highly respected and proven gaming keys. Illumination options are limited to the specific key you choose, but that’s merely a visual aspect, but there are options and lighting settings. It’s not wireless but, that's because hardwired connections yield faster responses, all you need is a PC with a USB 2.0 port. The software is compatible with Windows XP, Vista, 7, and 8. The USB port is right angled, so if you are right-handed, you may find its cable getting in the way of your mouse. The backlighting is bright but not even, and some keys may be dimmer or brighter than others. While all these keyboards make great choices, the Razer BlackWidow Chroma Clicky Mechanical Gaming Keyboard has exceeded expectations. With very few low points in its specifications, it offers fully programmable keys from start to finish that allow you to customize your gaming experience based on your preferences. The backlighting is also extremely customizable, and can even sync with your other gaming devices! Not to mention, of course, that it is one of the most popular keyboards on the market and sells better than any other. 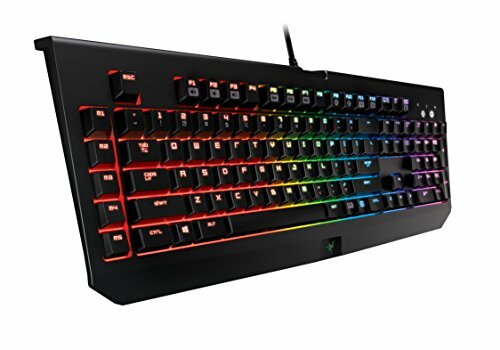 The Razer BlackWidow Chroma Clicky Mechanical Gaming Keyboard is definitely a solid choice, but at the end of the day, any one of these options would make an excellent piece of equipment to invest in. Based on your needs and budget, you can easily own a fantastic keyboard that will help you go above and beyond all expectations during gaming sessions. Sounds like a great deal to me!